As more homeowners seek to bring the indoors to the outdoors, fireplaces and fire pits are becoming an even hotter commodity — literally and figuratively. Fire pits are one of the biggest trends in 2016 for homeowners wanting to upgrade their outdoor living spaces. TWEET In fact, landscape architects surveyed by the American Society of Landscape Architects identified fireplaces and fire pits as the number 1 outdoor design element for 2016. Outdoor fireplaces and fire pits also make great focal points and gathering spots, Campbell says in a news release from Trex Co., which makes outdoor living products. “Once upon a time, the living room fireplace was the favored gathering spot for family and guests, and roasting marshmallows over a campground fire was part of the annual family vacation. 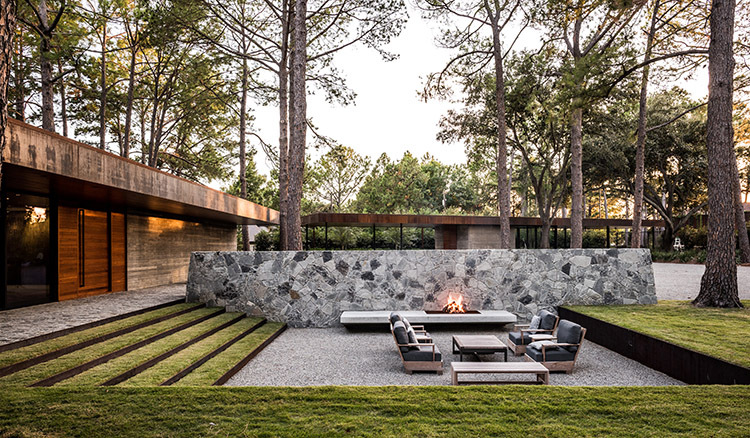 Modern outdoor living combines these two traditions into one with outdoor fireplaces and fire pits,” according to Belgard, a maker of outdoor living products. The Hearth, Patio & Barbecue Association says linear fireplaces and smokeless fire pits are growing in popularity. Homeowners are drawn to linear fireplaces because of their “sleek, modern design,” the patio association says. Gas-powered models, which are up to 12 feet wide, come equipped with glass that can tolerate high heat as well as with no-trim options for homebuilders and homeowners. Consumers also are attracted by the “sophisticated, contemporary style” of electric-powered models that feature realistic-looking multicolor flames, the association says. John Egan is editor in chief at LawnStarter, an Austin-based company that helps people find, schedule, pay for and manage lawn care services. Totally agree on integrating the feel between indoor and outdoor decor. Love the article! This post hits the nail directly on the head. The outdoor fireplace has become a fast growing trend that will add a fantastic outdoor living element to your home. Linear designs are great and other options are angled structures with extra seating. Adding cool veneer and décor for your geographic area makes it “fit in” and look “correct” as well. Check out http://www.backyardflare.com for DIY construction plans and additional information. I can’t agree more, it seems many families are deciding that the backyard patio is the new living room, plus with Plus with the wealth of knowledge available to DIY or buy a pre-made fire pit it’s getting easier every day to have that perfect outdoor paradise. I totally agree that the outdoor fire pit is bringing the family together. My family has just recently started to enjoy the outdoor fire pit and its like we are starting to get to know each other again. We got really cheap though and built ours with local moss rocks and burn wood. Though round, this has been a great addition to our backyard. I agree! It seems like everyone is building an outdoor fireplace now! Well at this age, outdoor activities are the in thing. I always do this for my kids in the holidays but in a different way.